When Mammy hits Tom on his head with a broom, he looses his mind and thinks he’s a mouse. 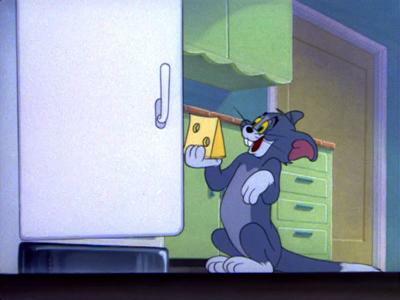 This to great annoyance of Jerry, because Tom eats all his cheese and wrecks his bed. ‘Nit Witty Kitty’ is a well-told cartoon, if a little bit slow and low on gags. Highlight of the cartoon are Jerry’s attempts to deliver Tom a “sharp blow on the head”.